Bus from KL to Kampar has limited daily departures from Kuala Lumpur TBS (Terminal Bersepadu Selatan). That is because there are only 2 players who supply the service. Edaran Express and Konsortium are the only two players who run buses from KL to Kampar. Since the launching of the KTM ETS train from KL to Kampar, many commuters opt to go to Kampar from KL by taking the ETS train. However, even with 16 train departures, commuters may find it difficult to get a train ticket from Kuala Lumpur to Kampar. Commuters going to Kampar need to compete fiercely, especially during weekends and festive seasons, with other commuters going to Batu Gajah, Ipoh and Butterworth for a train ticket. Thus, because of this reason, many still travel with bus from KL to Kampar. 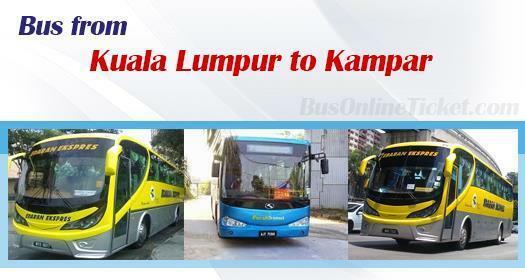 Bus service remains as an important option to travel from Kuala Lumpur to Kampar. The duration for bus from Kuala Lumpur to Kampar takes about 3 hours. It is a direct coach from KL to Kampar without any stopover, unless a washroom break is requested by passengers. The bus fare for bus from KL to Kampar costs in the range of RM 16.60 to RM 17.00. Children fare is also available at a cheaper price of from RM 12.00 to RM 12.40. All coaches from KL to Kampar will depart from TBS (Terminal Bersepadu Selatan) and will terminate at Kampar Bus Terminal. Kampar Bus Terminal is right at the heart of Kampar old town. Kindly note that for those going to Tunku Abdul Rahman University, you are required to travel by taxi or bus to Kampar new town. Kampar new town is about 10-15 minutes away from Kampar Bus Terminal. Besides Kampar locals, students in Tunku Abdul Rahman University and their families travel frequently between KL and Kampar. Hence, the demands for bus service between Kuala Lumpur and Kampar are strong. Commuters are advised to book their bus ticket online with BusOnlineTicket.com in advance to avoid disappointment.